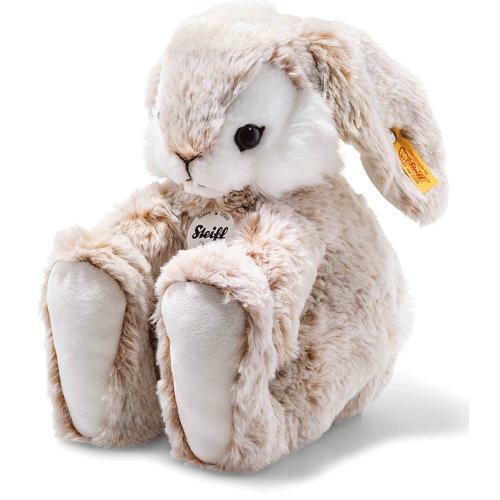 Steiff Flummi Rabbit is made by hand, in the finest beige cuddly soft plush. 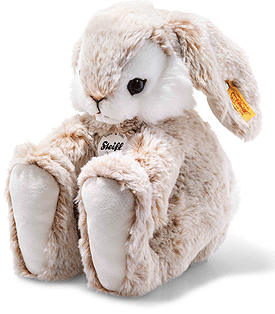 Flummi rabbit is 24 cm tall and is made from soft, gorgeous beige plush fabric. The cream-coloured soles of his gigantic feet are one of his most striking features. His lovely ears are also cream-coloured on the inner surface. His cute cheeks and his characteristic fluffy tail are made of plush fabric with long white strands. The area of his face around the eyes and down to his chin is white. His brown nose and mouth feature a touch of pink paint to give them a little contrast from his other features.